Register now and save your spot for this exclusive retreat. Only 16 participants will be able to join us this year! An actively invigorating yet relaxing trip with like minded knitters and fiber arts enthusiasts who will become fast friends to an unforgettable spot in the Alps in Switzerland: The Valais region, a sunny alpine area along the headwaters of the Rhône river. Many of the lower slopes are used for agricultural purposes, such as grapes (wine) and fruits like Apricots and we will pass through some of those regions on our approach. For this knitting retreat, the lodging is simple and functional, with extensive buffets for our breakfast, 2-course lunch and a 4-course dinner, stunning scenery and hikes up to the Aletsch Glacier, as well as shorter excursions into the surrounding nature. A themed hike to see open pastured sheep with a shepherd, and a workshop with local artist and shepherdess Fabienne Truffer to make adorable wool sheep from Fabienne’s own Valais Blacknose and Mountain Sheep herd. Enjoy 12 hours of knitting classes taught by 2 talented and inspiring knitting instructors. During your relaxed knitting classes, we are treated to coffee breaks and mineral water. And rest assured that there is plenty of free time to simply sit and knit, or go for walks, sit in the sun on your balcony, wander up the slope to sit on a soft patch of grass, take in the landscape and relax. And all of it in the alps in Switzerland. 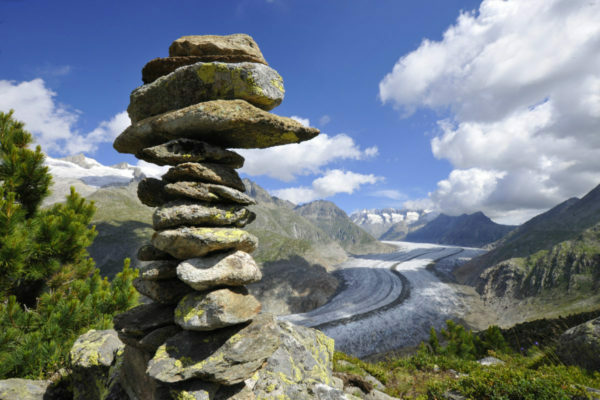 For this trip, you need to be in good physical condition and be able to walk for 4 to 5 hours, as some of the hikes we plan will take us up to the Aletsch Glacier and along smaller footpaths and possibly across suspension bridges. Of course you could opt to just stay at the hotel, but where’s the fun in that? Depending on weather, some of the hiking routes we consider might take us up to about 7500 ft (2300 m) elevation, so we are nowhere close to some of the heights found on common hikes in the Rocky Mountains in the US, but still please be prepared to bring hiking boots to take full advantage of the day hikes. You will not be okay in running sneakers. Other options include a walk over to the Alp museum where you can learn about traditional life up in the mountains back in the day, bread making and the old tools that where commonly used. If we are lucky we might see some of the traditional goats, that I think only exist in the Valais region of Switzerland, they are two colored, black and white, and distinctly so. At the end of the day soak up some sun on the hotel grounds, while breathing the clear mountain air of a car free village, or chose to go swim in the indoor pool. Even though some of the days can be physically active, all this is done with a no rush attitude, offering a slow paced experience of a secret gem in my home country. No one will be dragging you on endless bus tours from place to place at lightning speed, or make you speed hike up endless slopes only so you can forget what you took all those frantic pictures of. Settle in, breathe, relax, knit and discover a piece of Switzerland to cherish forever in your heart! This very intimate retreat is limited to only 16 participants. Stay high up in the mountains in a car free village accessible only by foot or gondola! Our bedrooms (base single occupancy) are located in one of the main chalet style hotels on a south-facing terrace high above the valley, and just south of the Aletsch Glacier, the largest glacier in Europe. If you’d like to share a room with a friend, just let us know when you are registering and both of you will save $200 off your registration! (all double rooms have 2 single/twin beds, and en suite facilities). 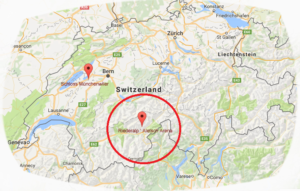 You are responsible to make your own flight arrangements from an airport near you to Zürich (ZRH) and to the retreat location. Zürich is one of the major airports in Switzerland and you will probably get the best fares flying here. For this location, it also is the closest. We will gladly help you with train and bus schedules to help you have a smooth transit to the cable car base station from where transport to the resort is organized. Also, if enough participants arrive around the same time at the airport, we can organize a shuttle to pick everyone up for an up charge. Please let us know if you might be interested in that and we can try and coordinate with the other travelers. For this retreat we are happy to have our very own Simone Kereit (OwlCat Designs) teach a selection of thoughtful workshops and she will be joined by local artist and Shepherdess Fabienne Truffer who will facilitate a adorable wooly sheep workshop and talk to us about her Vallais Blacknose sheep, a rare local sheep breed! More details on the class pages, but there will be a total of 12 h of fiber arts and slow stitching workshops. Split over several days, with ample time to relax and enjoy the world around you. Simone will be teaching Double Knitting, and two Slow Stitching workshops: Two project based workshops on hand stitching, English Paper Piecing and Embroidery. You don’t have to make any decisions, you will be taking all these classes and get to enjoy a host of new inspiration and techniques to take your knitting and creative stitching a step further! Includes lodging, meals, scheduled tours and day trips, gondola transfer to and from the car free resort, luggage transport from gondola station to hotel and back (it’s short 7 min walk for us), knitting and slow stitching classes, retreat tote bag, yarn and goodies. You just need money for extra wine (a glass will be included with your dinner! ), chocolate, personal expenses or any other trips that you might want to take (extra trip with one of the mountain lifts, Luftseilbahn instead of downhill hike, etc), oh, and did I mention chocolate? Does not include airfare from your airport to Switzerland nor airport transfer to gondola base station. A $650 non-refundable deposit is required to secure your reservation, an installment of $1250 is due by February 15th and the remainder $1200 is due by March 30th, 2018. If you are paying by check (US residents only), $50 will be deducted from your last payment.